The excursion boat Vista King is playing ‘follow the leader’, tailing behind the ore carrier S/S Edward L. Ryerson through the Duluth Ship Canal in Duluth, MN as both vessels enter the Duluth Harbor and Superior Bay. Dwarfed by the 730’ Ryerson, the 78’King is heading over to the Vista Fleet Excursion Dock, the Ryerson is on its way to refuel at the Murphy Fuel Dock then onto BNSF (Burlington Northern Santa Fe) Railway Dock #5 in Superior, WI to load iron ore pellets. The closeness of the 2 vessels allows one of the Ryerson’s deck officers to exchange a hand wave with a young spectator aboard the King. 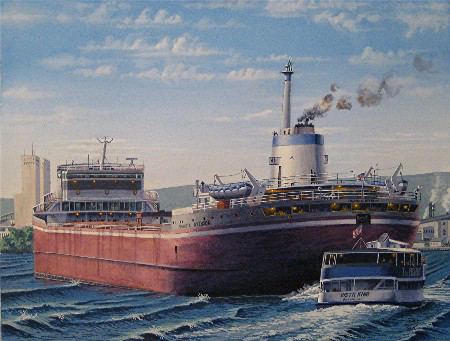 It is typical for smaller craft as the King to wait for the raising of the Aerial Lift Bridge and follow in behind larger commercial vessels when entering the Canal. On this very windy September 4, 2007 whitecaps are even found in the Harbor itself with 6’-8’ waves out in Lake Superior.